Mr. Amitabh Kant, CEO, Niti Aayog and Mr. Sourav Ganguly, Former captain of the Indian National Cricket Team felicitated the winners of HCL Grant 2019 at a ceremony held today at HCL Technologies Campus, Noida, in the presence of Mr. Shiv Nadar, Founder & Chairman, HCL, Ms. Roshni Nadar Malhotra, Vice Chairperson, HCL Technologies and Chairperson, CSR Committee, HCL Technologies, along with senior dignitaries, bureaucrats, NGO-partners and the HCL leadership. One of the biggest and most coveted institutionalized CSR grants of India, HCL Grant recognizes the rise of community-led ecosystems of NGOs. Three NGOs across the categories of Education, Healthcare and Environment received a grant of ₹5 crore each. This year, HCL Grant also introduced an additional grant of ₹25 lakhs each for the six finalists across the three categories, taking the overall Grant purse to ₹16.5 crore. During the event, the third edition of the “The Fifth Estate - NGOs transforming Rural India in Environment, Health and Education” was also released. Health – The 2019 HCL Grant winner in this category is She Hope Society for Women Entrepreneurs. Established in 2001, the organization is working in remote, border and isolated areas of Jammu and Kashmir on Physical Rehabilitation. Project Title: Humanitarian assistance to strengthen inclusion and safety of vulnerable persons especially women and children in conflict affected areas of Jammu and Kashmir. 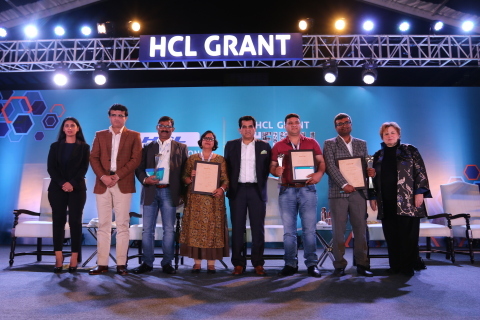 Environment – Wildlife Trust of India is the winner of HCL Grant 2019 in the Environment category. WTI has been working towards wildlife and biodiversity conservation issues across the country since 1999. Project Title: Connecting Landscapes, Empowering People and Protecting Elephants- An initiative to secure the Baghmara - Balpakram Elephant corridor and protect the wildlife habitats of Garo Hills, Meghalaya. Project Location: Garo Hills, Meghalaya. Education – The winner for HCL Grant 2019 in the Education category is Srijan Foundation. Established in 2001, the Srijan Foundation aims to work for the welfare of the underprivileged by building capacity of the community as well as grass root organizations. Project Title: Educating the Women Farmers for better Livelihood Opportunities and better Income Generation. “HCL Grant is a path-breaking initiative towards recognizing and supporting the inspiring work done by NGOs in three key development categories in India,” said Ms. Robin Abrams, former president of Palm Computing and longest-serving Board member of HCL Technologies. Till date, HCL Grant has committed ₹35 crore (US$5.4 million) towards rural development with an ambition to reach over 900,000 people. Today, the seven HCL Grant recipients are addressing some of the most pressing issues in the remotest corners of the country with innovative solutions – creating the last mile support framework. Since 2015, HCL Grant projects have already significantly altered over 3,70,000 lives in 3500 villages across 26 districts in 12 states of India. This year witnessed an overwhelming response from over 4000 applicants. The applications were carefully scrutinized through a robust 8-month long process, monitored and audited by Governance Partner, Grant Thornton.